TORONTO, Sept. 21 (Korea Bizwire) — Bombardier Commercial Aircraft today announced the delivery of its first 90-seat Q400 aircraft. The aircraft was handed over to India’s SpiceJet Limited (“SpiceJet”) the launch operator for the extra-capacity, 90-seat aircraft. SpiceJet’s standing as the country’s favourite airline has been further reinforced by the multiple awards and recognitions which includes the US-India Strategic Partnership Forum Leadership Award to Ajay Singh, , Global ‘Low-Cost Leadership Award’ conferred to Mr Singh at the Airline Strategy Awards 2018 in London, ‘BML Munjal Awards 2018’ for ‘Business Excellence through Learning and Development’, ‘Best Domestic Airline’ Award at Wings India 2018, ‘EY Entrepreneur of the year 2017 for Business Transformation’ by Ernst & Young, The CAPA Chairman’s Order of Merit for fastest turnaround in FY 2016, ‘Asia’s Greatest Brands – 2016′, ‘Global Asian of the Year Award’ & ‘Asia’s Greatest CFO 2016′ at the AsiaOne Awards held in Singapore, ‘World Travel Leaders Award’ at WTM London, ‘Best Check- in Initiative’ award by Future Travel Experience global awards in Las Vegas, ‘Best Domestic Airline’ award at the 10th ASSOCHAM International Conference & Awards (Civil Aviation & Tourism). 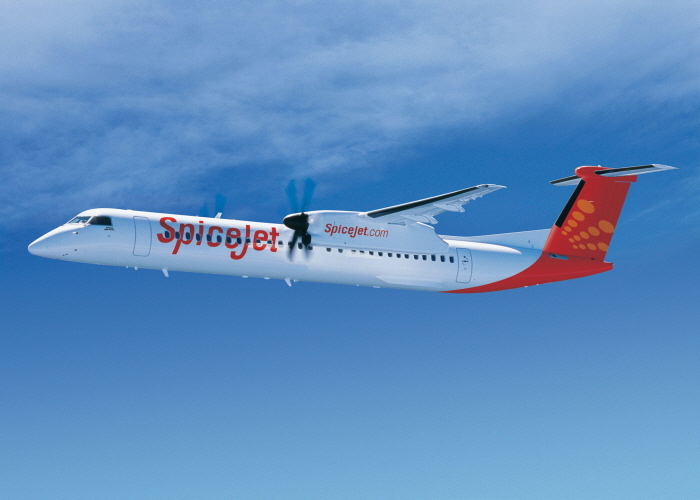 Images of Q400 aircraft in the livery of SpiceJet are posted with this news release at www.bombardier.com.